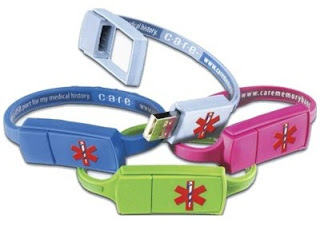 Care Memory Band Medical Alert Bracelet has preloaded software, simply plug into USB port on any PC or MAC. Fill in the forms, provides instant access to life-saving information during a medical emergency. Available in 5 colors and 5 sizes. The system software is only used to load the patient data, for an entire family if needed. Any PC can read the bracelet data. Patient information is organized into an easy to read file for quick access. You can also electronically transfer or print all of this information for new health care providers, insurance companies and family files.